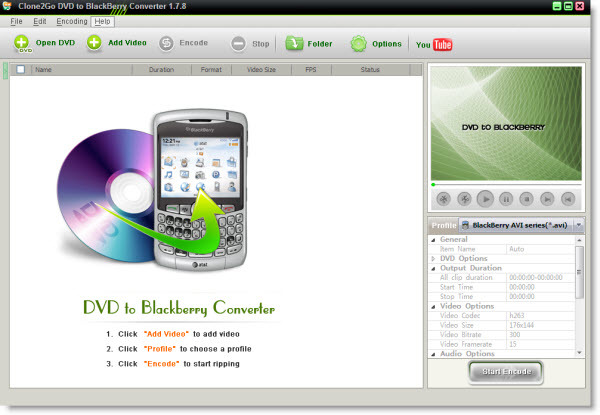 How to convert DVD and video to BlackBerry Storm? You may have at hand many fantastic DVD movies and video files, which you definitely love very much. Also, you have a smart BlackBerry Storm and you really want to watch these DVD movies and video files on your BlackBerry and take them on the road. Download YouTube videos to BlackBerry (as a YouTube downloader). Insert the DVD disc into the disc drive, click the "Open DVD" button to import it if you are going to watch the DVD movie on your BlackBerry Storm. Or if the DVD movie is saved as a folder on your computer, you need to click the "Add Video" button to locate that folder, which is composed of two separate folders: VIDEO_TS and AUDIO_TS. From the VIDEO_TS folder, select the .vob file to import and then click "OK". If you want to watch YouTube videos on your BlackBerry Storm, click the "YouTube" button on the main interface. In the pop-up window, copy and paste the URLs of the YouTube videos one by one. There will be a list of the added YouTube videos, which will be downloaded automatically one by one. The downloading status is clearly shown on the list. After the status of all of them indicates "Completed", you can tick whichever videos you want to watch on your BlackBerry Storm. After the DVD's, videos or YouTube videos are imported, you can preview it on the main interface. If you only want a clip of the DVD/video, you can drag the "Start to trim" and "Stop to trim" buttons to get the certain segment. Now you can click the "Start Encode" button to starting ripping DVD movies, converting video files and converting YouTube videos for your BlackBerry Storm. 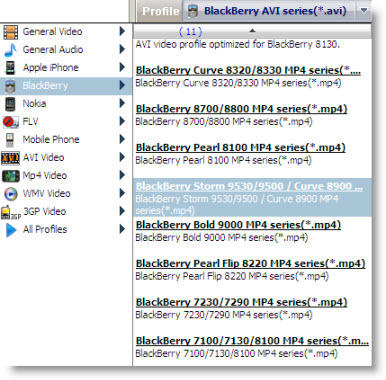 After you get the output video files, you can now begin to transfer them to your BlackBerry Storm.